Angelopoulos, Kokkalis, Papandreou, the Clintons & Harvard - What a Happy Family! Today we are going to run some trivia by you. What does Gianna Angelopoulos-Daskalaki, Socrates Kokkalis, George Papandreou, and the Clintons have in common? Well they are all part of the John F. Kennedy School. Yes make no mistake about it. We are talking about the same institution that recently offered our former Prime Minister a job! Gianna, as we so lovingly call her in Greece (Editor clearing throat) is the former President of the Athens 2004 Olympics Committee And Mr. Socrates Kokkalis, the man behind Intracom in Greece, is also the founder of the Kokkalis Program on Southeastern and Central Europe. It looks as if these three personalities, who are not really well liked in Greece (for a truckload of reasons) are now molding young minds and preparing the next leaders for our part of the world. Recently, former US President Bill Clinton and "Ambassador" Gianna Angelopoulos-Daskalaki chose former Foreign British Secretary David Miliband and the former President of Ghana and chairman of the African Union John Kufuor to be the first speakers at the upcoming Global Public Leaders Program. Mrs. Angelopoulos-Daskalaki had also spoken with the President of Mexico Mr. Felipe Calderon about his participation in the program following the completion of his term in office. So who is Gianna Angelopoulos-Daskalaki? She is an organizer of the 2004 Olympic Games in Athens, (and now) Ambassador of the Greek State. She is also a lawyer and former Member of Parliament and married to one of the wealthiest men in Greece (her brother-in law owns the Olympiakos basketball team, as well as Halivourdiki). In 1986, she won a seat on the Athens Municipal Council and in the 1989 elections, she was elected Member of Parliament with the New Democracy party. In 1990, she married (very wealthy) Mr. Theodore Angelopoulos and resigned her seat in the Parliament to become involved in her family's international shipping business. In 1994, she was appointed Vice-Chairman of the Dean's Council of Harvard University's John F. Kennedy School of Government. There, in 1996, she helped lead a Kennedy School Symposium titled "The Greek Paradox," which examined ways in which her country could close the gap between its promise and its performance in the political, economic and foreign policy fields. Also in 1996, she accepted the Prime Minister's proposal to lead a Greece's campaign to host the 2004 Olympic Games. After leading the bid to success, she returned to the shipping business. For her service, the Republic of Greece appointed her Ambassador-at-Large in 1998. In 2000, when slow progress and gridlocked bureaucracy put Athens in danger of losing the Olympic Games, she was asked to assume the presidency of the ATHENS 2004 Organizing Committee for the Olympic Games. Under her leadership, Athens made up for lost time and gave the world what IOC President Jacques Rogge called: "an unforgettable, dream Games." She then purchased the "Eleftheros Typos" newspaper, which traditionally backed the right-wing and flip-flopped it to support God knows what! In fact the paper was used to criticize the policies of former Prime Minister of Greece Costas Karamanlis. After years of sipping champagne and living in luxury, good old Gianna packed up her bags and is now a Convening Sponsor of the Clinton Global Initiative. (Editor - It is good to know people in high places, she is a woman that actually believes that she has been blessed by the Gods to rule Greece, the Int'l Olympics Organizing Committee, the globe, the galaxy, the universe.. !!). At the same time she continues to serve as Vice-Chairman of the Dean's Council for Harvard's John. F. Kennedy School of Government. 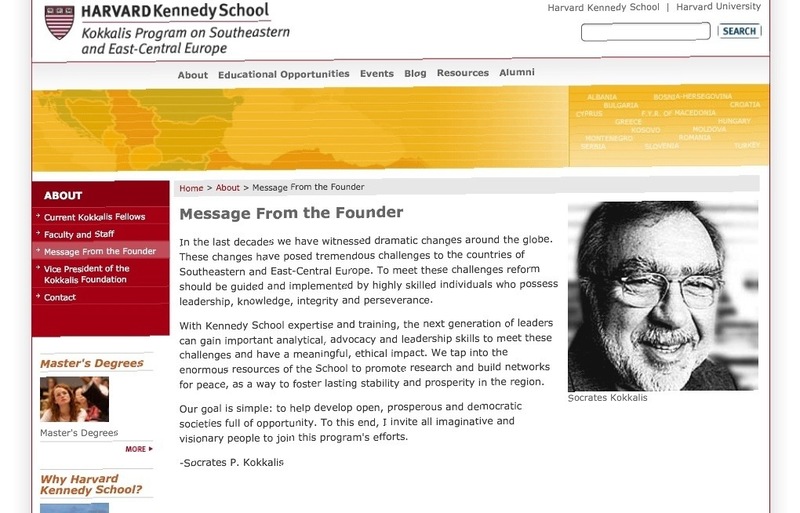 Guess who else is a loyal to the Harvard Keneddy School as well? Why its Mr. Socrates Kokkalis of course. In fact his program titled "Kokkalis Program of Southeastern and Central Europe" was established at the Harvard Kennedy School in 1997 to train, engage, and connect present and future leaders to effectively serve the public good of Southeast Europe. So the mystery is over... We now know how George got his job at Harvard. Editor - Isn't it just dandy that the people who the Greek press constantly -but informally- criticize for "meddling in political and economic affairs" are now endorsing the education of future leaders in the areas of Southeastern and Central Europe? The same regions that Kissinger said would serve Western interests. Obviously, Mrs. Daskalaki, and Mr. Kokkalis are in a "business as usual" mode. They are now training the "future leaders" of Greece, the Balkans and South-East Europe. How fortunate mankind will be, the puppet-masters are at work once again!!! These "shady" and "suspicious" personalities, have been rumored by many in the press for poking their noses in State affairs, for meddling with government decisions, for mishandling funds, for being involved with Germany's Siemens, and even for overthrowing a government. Some sites have even said that Mrs. Aggelopoulou is also SYRIZA's biggest supporter, because her son is a big fan of Alexis Tsipras! The same party that speaks about equality, and taxing the rich cuddles up with people such as Aggelopoulou who only go to royal weddings and appear alongside the Clintons. Everything is making sense now, as far as George's job at Harvard Kennedy School is concerned and his close knit ties with the Clintons. You know the saying, if you rub my back I will rub yours? Looks George knew exactly whose backs to rub in order to climb the ladder in power. No surprises here... his father was suspected of doing the same thing. In fact we are glad this bit of trivia was brought to our knowledge. It totally confirms our reasons for continuing our support to Costas Karamanlis. The Greek elite, or people such as Mrs. Gianna and Mr. Kokkalis never liked Karamanlis... and they may have helped in his downfall, but the more we learn and the more we see how all these people are interconnected, the more we begin to realize just who the patriots are... and who the traitors. And one last thing... Jeez... at times we wonder... this University is known as being one of the finest in the world but in all reality it looks like it is nothing more than a center where rich kids are molded into become the new one percent.